The United States Department of Justice needs to hear that web accessibility regulations matter to disabled people. Can you help? This post will explain how. As readers of this website know, the United States Department of Justice (DOJ) is thinking about adopting web accessibility regulations. And the agency has been thinking for a long time. First announced in 2010, there has been delay after delay and we still do not have any regulations. The Americans with Disabilities Act already requires both public and private sector web access, but regulations are needed to raise awareness and stop the excuses. Now we all have a chance to tell the DOJ what we think. This past April, the DOJ announced it was starting over again in its plans to adopt specific accessibility requirements for public sector websites. The agency withdrew its 2010 Notice of Proposed Rulemaking and issued the awkwardly titled Supplemental Advanced Notice of Proposed Rulemaking, or SANPRM. 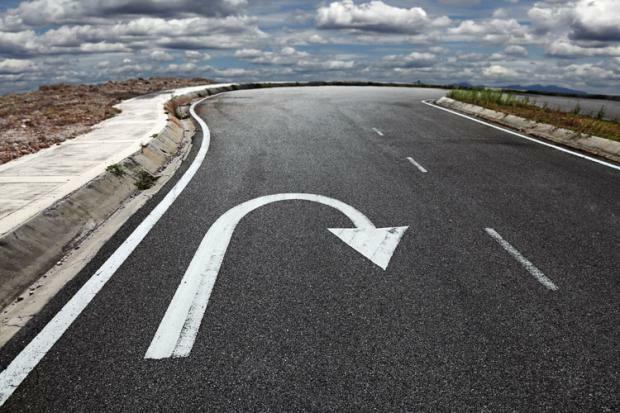 The move was a giant step backward in the quest to obtain public sector web regulations, which is why this post is illustrated with a big U-Turn sign in a road that stretches out to the horizon. You can read more about this delay and others in the Spring 2016 Digital Accessibility Legal Update on this website. Comments need not be fancy or long. The most important thing is to tell the government in your own words why public sector digital access matters. Think about how you use (or would like to use) government websites and mobile apps, and explain what happens when access barriers get in the way. Do you miss video content because there are no captions? Can you navigate to the information you need without a mouse? Does your screen reader software allow you full access to site content and features? Here are some examples of government sites to get you thinking; there are hundreds of others. Criminal justice sites. A blind mother recently needed to pursue legal claims because she could not access the local jail website to sign up to visit her son who was in jail. Do you need access to these types of government sites and others? In 2016 no one should have to explain why access is needed now, but the comment period is open and the government needs to hear from disabled web users. File online directly with the federal government through the comment page for the ADA public sector proposed web regulations. Send comments to the American Council of the Blind (ACB) and the American Foundation for the Blind (AFB) for forwarding to the Department of Justice by sending an email to Comments@AFB.net. Read ACB’s statement about the delayed regulations. Send comments to the National Federation of the Blind (NFB) for inclusion in a letter to the Department of Justice by completing the NFB web regulation comment webform. Read the NFB post about the public sector web regulations. Send comments to the National Association of the Deaf (NAD) by sending an email to nad.info@nad.org. Comments can also be sent directly to the U.S government the old-fashioned way, by US mail, overnight delivery, or even hand-delivery. If you are not using the website or sending through an advocacy organization as explained above, you must include the official identifier for this regulation, which is: RIN 1190-AA65 (or Docket ID No. 128). Rebecca Bond, Chief, Disability Rights Section, Civil Rights Division, U.S. Department of Justice, at (202) 307-0663 (voice or TTY). This is not a toll-free number. Information may also be obtained from the Department’s toll-free ADA Information Line at (800) 514-0301 (voice) or (800) 514-0383 (TTY). People can also contact the organizations listed above that are collecting comments. Let’s flood the government with comments and let’s get digital accessibility regulations once and for all.